I desperately held onto the car door as the slavering zombie on the other side tried to get into the car to get at me. This was the worst race start EVER. I’d woken up to find my friends had left me behind and now there were ZOMBIES stopping me getting to the start of Silverstone Half Marathon. And then I’d woken up. To a thankfully zombie-free bedroom. It didn’t matter how the race went today; terrible pacing, forgetting my gels ... even losing a trainer wouldn’t be so bad ... at least I would be able to say with absolute certainty there would be no evil dead trying to eat me. Despite my lets-be-positive thoughts, the drive was very much like the start of a horror film, with thick fog and misty lanes meaning that fog lights and a slow start were a certainty. Not having an undead-killing-axe, I kept the car doors locked. The roads however were fairly clear and it was an easy drive until the slow down on the A43 as we got closer to the race circuit. 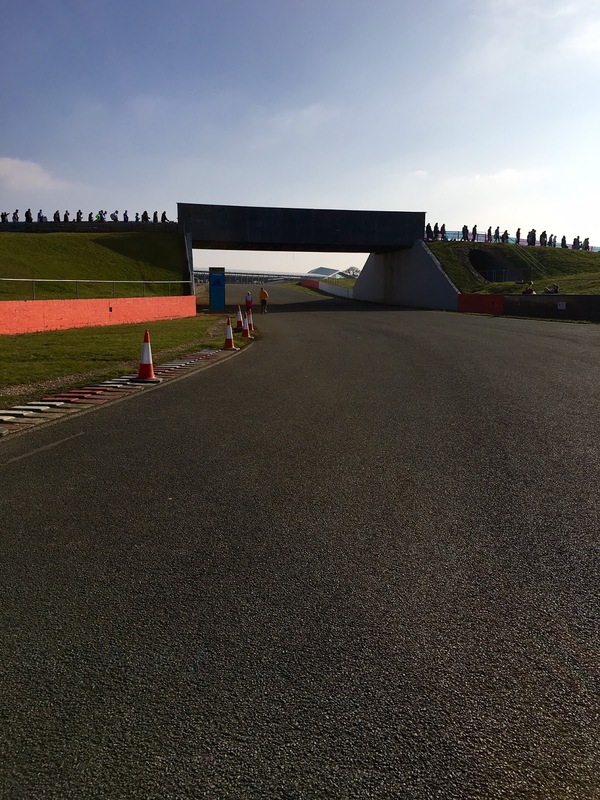 However, the race organisers had anticipated this and we were directed smoothly through Silverstone village, through fields and onto service roads and the car was parked within 20 minutes. The forecast had been for a very warm day ...warm for for March in England anyway. But it was currently very cold. And I badly needed to pee. I had the difficult job of trying to judge the balance between ‘not leaving it to late in case of a loo queue’ and ‘not getting out a nice warm car too early’. Hopped out of the car and spotted 3 portaloos at the end of the car park, with a queue already snaking back 100m. With a good selection of non-runners in the queue. Grrr. While I appreciate that non-runners ALSO have to pee, there is nothing like pre-race nerves to make the runners need the loo just a little more urgently. I’m a firm advocate of non-runners having to cross their legs until the race starts and THEN using the suddenly-empty toilets. Yep. I’m a Toilet Nazi. 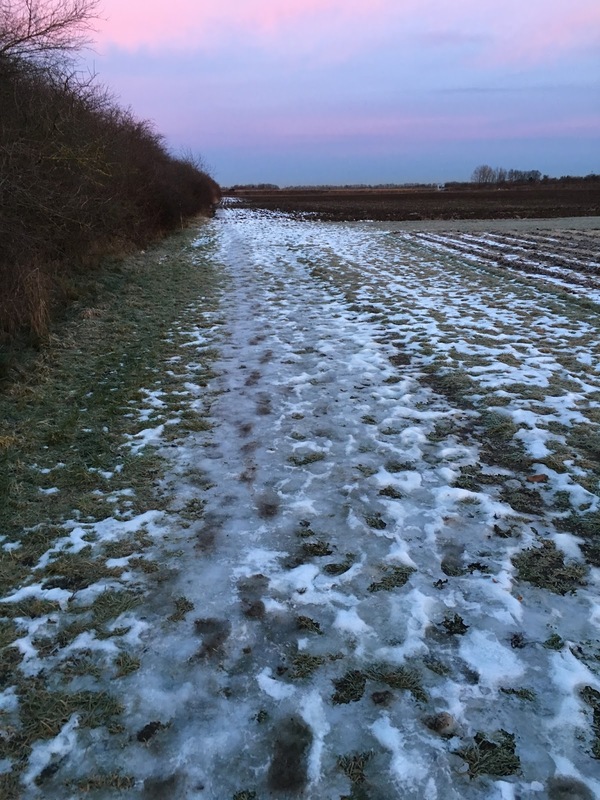 Despite my mutterings about non-runners in MY toilet queue, I WAS pleased I’d remembered my nice warm hoody, my extra thick buff and my gloves ... but I was still freezing. Standing still in a chilly car park waiting to pee does nothing for my pre-race nerves. Or pre-race temper. Especially when it’s pre-coffee time. And when there’s no guaranteed supply of toilet roll. Please, Race Directors .,.. more toilets! Loo queues so long you can strike up lifelong friendships AREN’T a selling point! Even if it does slightly calm the nerves bitching about the expected lack of loo roll and blocked toilets. I eventually made my way into and out of The Poo Tardis and collected my kit from the car. As usual, the bigger the drop bag, the more I feel I need to fill it with. With the size of the Silverstone HM kit bag I could survive 2 ultras and an overnight camp. Hooray! Loz and Rae are here!! As per usual as soon as I got the race start I needed another wee. It’s like a pavlovian response – I see a banner proclaiming ‘start’ and I immediately start hopping around desperate for the loo. I’d probably even get this after days of dehydration. 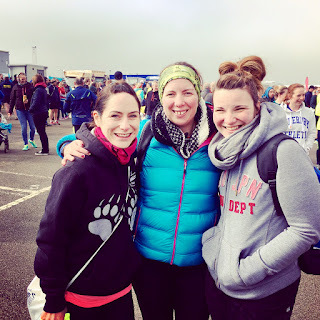 Luckily Rae and Loz deduced where I’d be and after I finally exited they spotted me and we did our pre-race ritual of ‘bananas all round’ like a circle of lycra-clad chimps. Also spotted Danny whose race Hope 24 I’d enjoyed supporting at last year (instead of ‘supporting’ read ‘eating snacks at’) who was also racing today. It was still a chilly morning so I was loath to undress but I was concerned about having time to do a warm up (get me - all keen!) and how long I’d have to wait to hand my kit bag in but it was seamless. Walk up – hand kit bag over. Done. I’d handed in my lovely toasty gloves and warm jumper but I had my bin bag so I popped it on doing my finest impression of a bag lady with a lycra fetish. 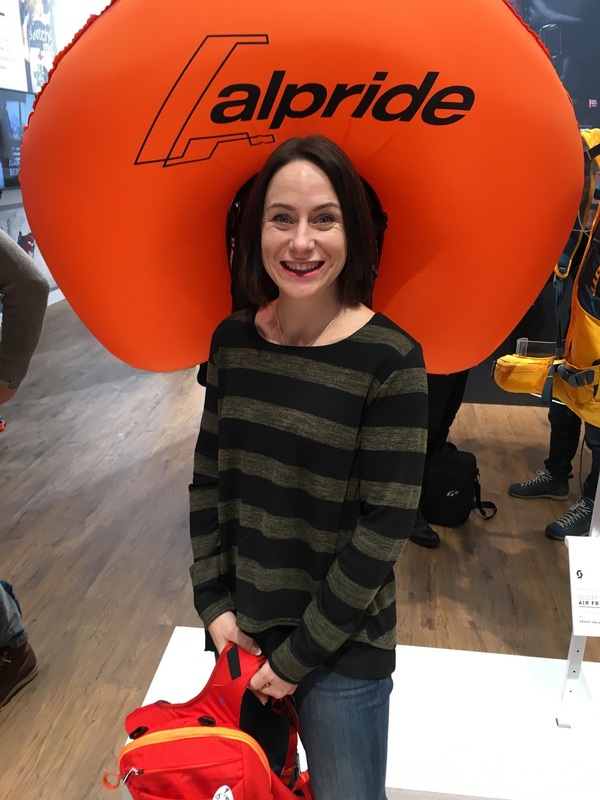 But I was a WARM bag lady with a lycra fetish. People started moving towards the start pens, but there was no space in the race village to warm up – it was just too busy. But I needn’t have worried as there was a nice smooth area of track behind the start pens that I could use for my warm up. I tried to do this in my bin bag but the rustling made me sound like I was herding snakes so I took it off and held it like a black plastic security blanket. Did the usual drills, bit of high knees, back kicks. Didn't trust myself to grapevine or run backwards as my coordination is shocking even when I'm not nervous at the start of a race. No point damaging myself before I’d even started. If it all went to hell during the race I could always PRETEND to fall down and break my leg but I didn’t really want to do this by accident before the starters gun even went off. I found a nice spot in the correct timing pen and after huffing at the men spotting the girl in their starting pen *gasp - the cheek! * and positioning themselves in front of me as they’d ‘automatically be quicker’, I spotted another girl who was wearing one pink trainer and one green trainer. Tapped her on shoulder to ask about them. Apparently they were a pair rather than an accident. I know it's bad form to buy shoes judging on whether they're 'pretty' or not but I thought these were great! I’d set my watch up to pace the run at between 6:45min/miles and 7:15min/miles. 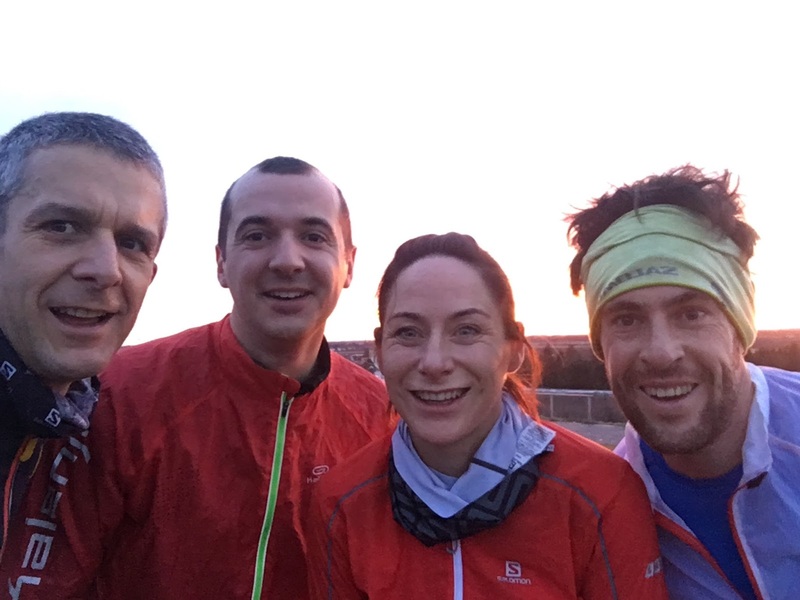 I haven’t done any road racing for about 2 years so didn’t have a clue how I’d feel and I didn’t know whether the lack of running miles would be a problem. I’d planned a negative split and to go out at 7:15 min/miles which would be about a 1:35 half marathon but decided to go for broke. And decided to see how far I was from my PB. Hell. I could always walk it in, right? … why does it always seem a good idea to do something different and new about 10 minutes before the race starts?? At the start. Not sure why they're all saluting. Maybe it was a 'hands up who wants a PB' poll that I missed. As always at the start of any race, it feels like the whole field streams past me. I know I started in the right place and in the right pen but it’s difficult to ignore people and trust your own pace, run your own race … especially when it feels like you're going backwards. I was also slightly concerned that 50% of my pre-race nightmare had come true ... everyone appeared to have left me. I started looking nervously around for the zombies. Right. Check watch. Yep. On pace. But I started worrying and doubting my watch when it told me I was running 7:03 m/miles but the mile markers told me 7:22s. That was a big gap. However, it had been so long since I ran a road race I'd made a rookie error and forgotten about the gap between the start time and the time crossing the line. I didn't even twig until about 5 miles in. Just assumed I was miles off pace but all I could do was judge it by my own running watch. Glad I didn't try to speed up to reclaim those seconds. Absolutely no wee-ing allowed at this race. Ever. 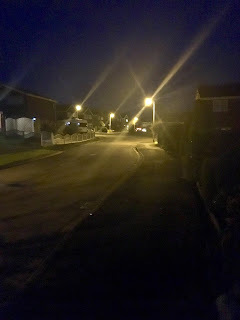 I settled into the run a bit more and started to take notice of the runners around me; lady in a pink top, man in a yellow top and a man in a cancer for children top all were with me most of the way although I lost them and they lost me every now and then, we were all running a similar pace. We passed more people than we were passed by … probably all the enthusiastic positive-splitters at the start but I did do a double take when I was passed by a man with a cigarette behind his ear ... Then realised it was the white end of his sunglasses. Phew! We all got passed by a man wearing an orange jumpsuit and a space helmet covering his entire head. He was speeding past everyone and despite the heat and his heavy clothes, we didn't see him again. Must have knocked in a brilliant time. Also saw Tony Bowe, a club friend, 100 marathoner and ultra runner ahead of me at about 6 miles. He was going for a faster time than his half marathon the previous week and was storming it - was about 6 minutes up on his time but the heat was making it tough. Hope he hit it! Also got some proper belting cheers from Mac about 8 miles! Thanks Lovely! 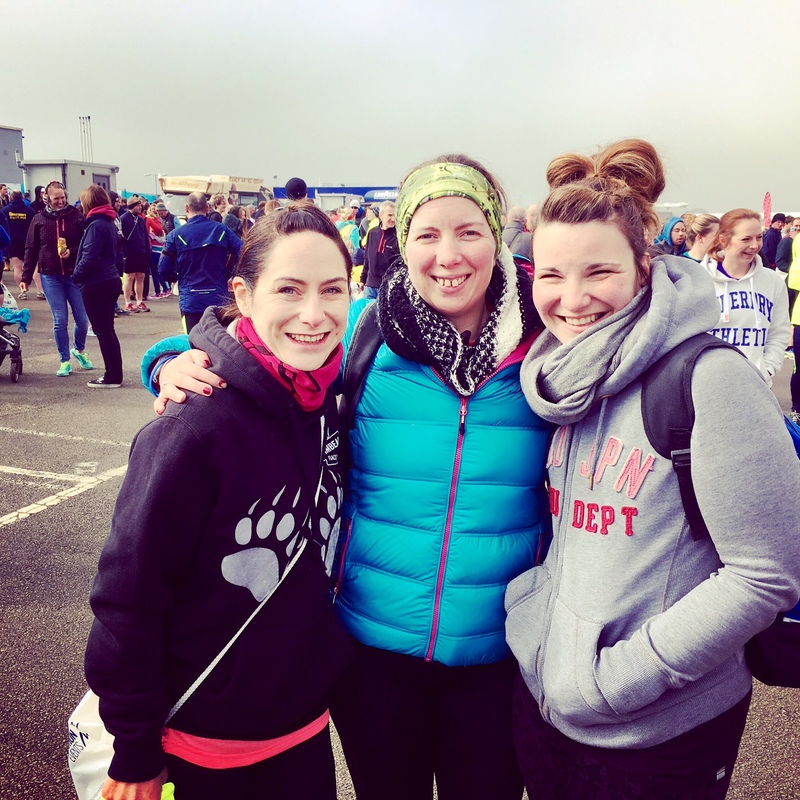 I remember running Silverstone Half Marathon in 2013 and finding it so SO hard. I’d had a horrible virus and and was feeling dreadful and thoroughly hated it. It was a lot easier this time, no real headwinds and I didn't feel like I needed to lie down every mile (it was a hellish race last time) and this year I thoroughly enjoyed it up until about 9 miles. At which point I wanted to lie down. Standard in a half marathon I think. Last time I was on antibiotics and felt really tired and sick but really needed the time to estimate my marathon time for Paris. I remember I’d started fading from mile 4 (not surprising considering how I felt) but had still managed a 2 minute PB on my previous best time. 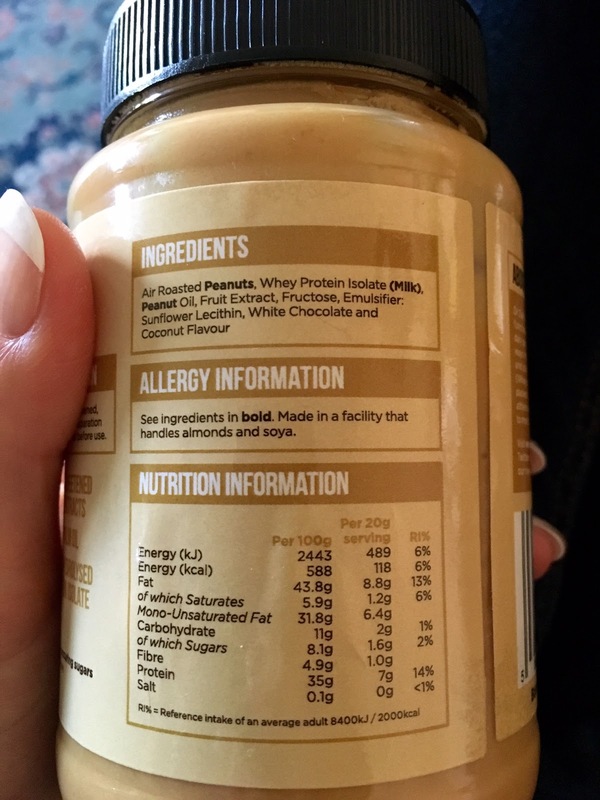 I was using the Torq banoffee gels (thanks to a Wiggle voucher sent by TD Investing) as my race fuel and they were really tasty - it was like having a mini pudding to look forward to. I was finding that I needed water to have them with but this wasn’t a problem as I carry a bottle of water with me on half marathons and marathons like a little sloshy security blanket. The gels were amazing but very sticky and since I have a hatred of littering, I stuck the packets back in my race belt and managed to stick everything to my phone which was also in there. If I really started struggling, I could crack open a gel and stick myself to a faster runner passing by. I was really pleased with my pacing as had been knocking out steady 7:03 and 7:04 min/ miles and it was about this point when I slowed to grab a water and only dropped a second that I realised that the watch was on average pace overall not average pace per mile. Argh! So I'd actually slowed a LOT to drop that overall. Bugger. I found out afterwards that my miles were reasonably even apart from mile 12 which I dropped a lot of time – about 20 secs for this mile alone. I’d used a new setting on the watch ... yes, yes I know ... nothing new on race day and set up a 13.1 ‘workout’ but I didn’t realise that this option knocked out the average miles and the laps. Frustrating to find this out late in the race. And if I’d known I had slowed this much, I’d like to think I would have been able to pick the pace back up. Never mind. At least I found out before any big races. I would also be using my ‘it was a warm day’ to excuse my slacking in the last mile. Apparently it was the hottest Silverstone Half Marathon ever … but it was hardly 30 degrees and heatstroke weather. However, I did appear to be working on my sun tan early this year with my race vest outlined in red on my usually pasty white shoulders. I also had a matching red nose. This running is SO glamourous. Don’t believe ANY runner that says they run to keep in shape unless that shape is a badly chafed, toenail-less, sunburned kind of a shape. 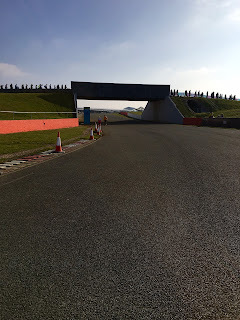 The Silverstone racecourse is almost entirely flat apart from some slight inclines and some very short sharp bumps where it crosses bridges over the track and and I'd been careful to take the corners really tight. There was a fair amount of space between the runners and it was fairly easy to keep it tight and take the shortest line, so it was gutting when my watch ticked over the magical 13.1 distance when there was clearly still about 400m to go. I could see the digital clock over the finish line and when it ticked over 1 hour 34 minutes I knew it would be close to me getting a PB today … if only I could remember how long it took me to cross the line at the start …! I really gave it some welly (you can take the girl out of Dorset …) but even going at my best just-cross-the-damn-finish-line-and-get-done speed I was pretty sure I’d missed my previous PB time. Chip removed, medal attained and over-priced finishers photograph taken I went to claim my baggage. More specifically items in my baggage. Even MORE specifically the PB creme egg in my baggage. I may not have been sure of my finishers time, but I was damn sure I’d run under a 7:08 min/mile pace. Which was most certainly a pace PB. I’d like to say I enjoyed the creme egg. But it didn’t really have a chance to reach my taste buds. I practically inhaled it. Also thanks to TD Investing who sent out £100 Wiggle voucher which meant I could buy some gels and the top I was wearing (among other kit!). Much appreciated! They sent out several to runners and triathletes on Twitter and I was one of the lucky ones! I enjoy a good list of facts especially when there are some statistics thrown in there and even more so when they’re about fitness. When I saw this one from Anax Fitness I found some of the facts quite surprising. 72% of people don’t work to a training plan or record goals! I was really surprised. How can they tell if they’re progressing? How will they know if they’re getting fitter? It would find it really difficult to keep motivated about going to the gym … I can see why gyms get quieter after the rush of new year resolution memberships in January. I probably only go to the gym 2 or 3 times a week, no more but when I do I have to make sure I know exactly what I’m doing and preferably have it written down. If I have no plan, I drift aimlessly from machine to machine not really achieving much. If I write a plan before I go I work much harder as my visit has a point ... otherwise what’s to stop me pressing the off button on the treadmill when I get a little bit tired? It makes it so much harder to stay motivated! I spoke to some friends about this as I wondered whether being used to training towards races and training to maintain my weight (after being 5 stone heavier previously) has made me look at fitness in a different way. It was really interesting to hear their views and to see how they differed from mine and interesting to see the difference between working from a targeted plan and not having a plan – doing it because it is something that you ‘should’ do. And it was very much this – they felt they SHOULD do it but didn’t really want to. 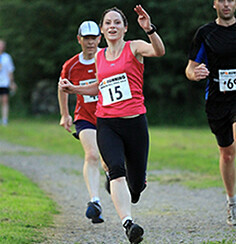 I do my sessions because I know it will make my races easier (the races are the fun bits!) and that – a lot of the time - I will enjoy the sessions while I’m doing them and I KNOW I will enjoy the sense of satisfaction afterwards. It’s rare I don’t have a race planned in – I use these as mini goals to keep me motivated and to keep the momentum going ... and I’m lucky that I have a partner who has similar motivations and who understands mine! What do you do? Do you have a plan when you go the gym? I’d be really interested to hear! p.s. Anax Fitness emailed me a copy of the infographic as they thought I might be interested but I wanted to pop it on here that it was sent to me as it contains a link and advertising for their site and products :) Didn't take any money or anything ... just quite enjoyed the stats! 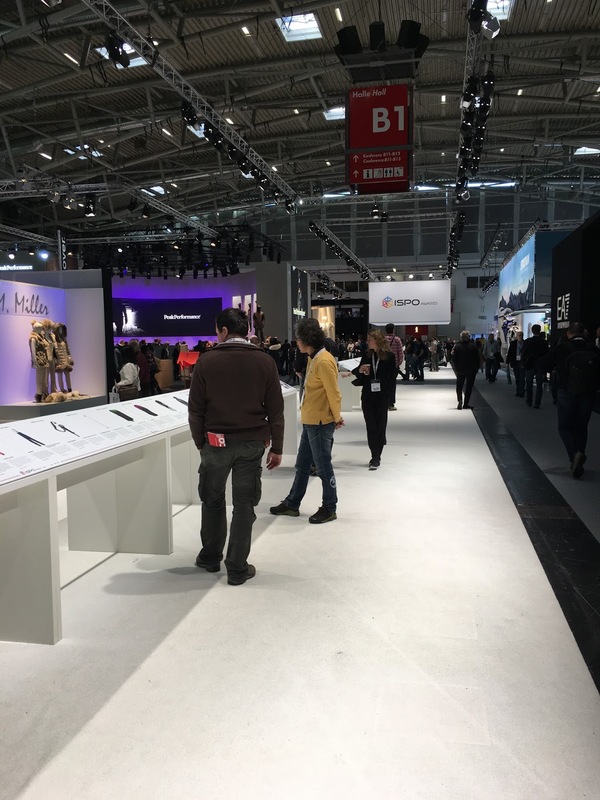 I’m not known for my amazing sense of direction so when I went along to the ISPO Outdoor Adventure Sports Show in Munich, which was 16 footballs fields in size, I KNEW I was going to get lost. However, in terms of places to be lost in, this was a good one. Hundreds of feet of shoes, foothills of ski equipment and enough gadgets to get a SkyNet robot REALLY excited. 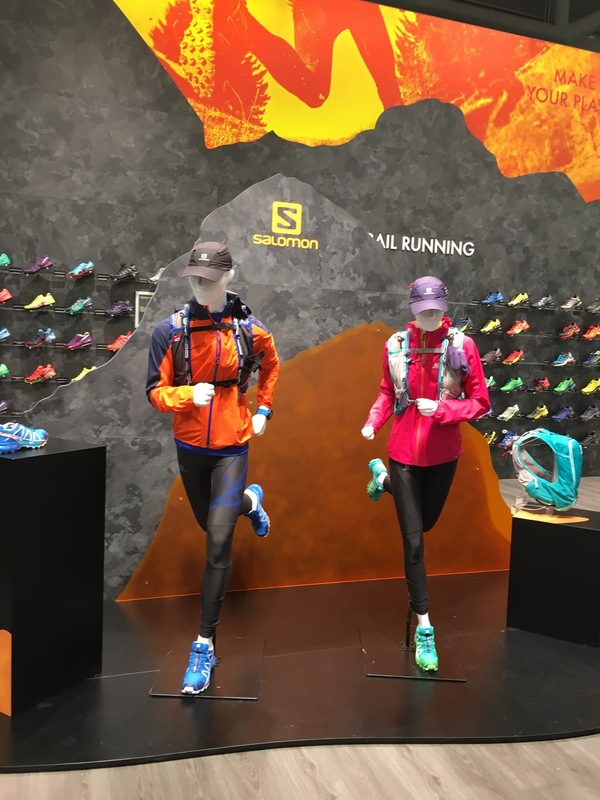 Salomon had invited me along as one of the Salomon Insiders, a group of users who signed up on the website to answer surveys which gave feedback and direction to the range of Salomon kit. Three of us were picked, Jean-Francois from France, Frank from Germany ... and me! Not just entry to the show was included; I also got a sneak peek at the Salomon range and at their new brand positioning – to turn your training into play and use the outdoors as your playground. I could thoroughly relate to this. Why train on a pavement when you could play in the mountains? 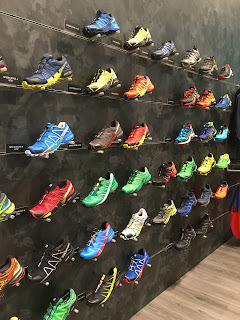 I was also a bit over-excited to get a peek at the new Salomon Speedcross 4 (although I’m not ready to retire my much-loved and trusty (if well-worn) 7 pairs of Speedcross 3 just yet). Salomon are also putting some serious work into their road shoes and have launched some real contenders out into the road shoe market. Exciting news for everyone who enjoys their Speedcross 3 as you’re now able to get a road version. 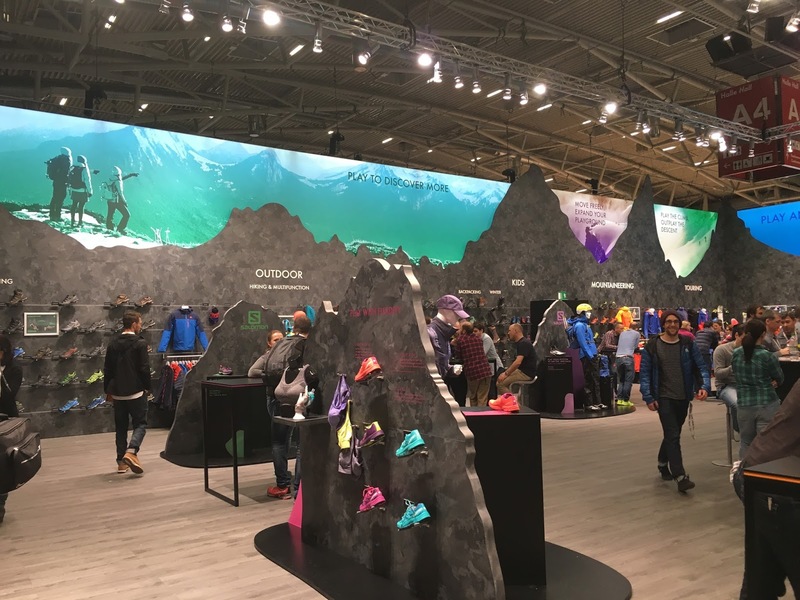 I thoroughly enjoyed the ISPO show and it was quite an experience. Not being a skier, I had no idea of the sheer amount of kit that appears to be required to take part. Mountains of it in a rainbow of colours and sizes and for different types of skiing and different types of snow. There were stands full of headtorches, the brightness of which you could adjust with a touch on your phone or a tap on the front. Shoes with every conceivable tread. Boots with attached spikes and crampons. Clothes in every style and colour. 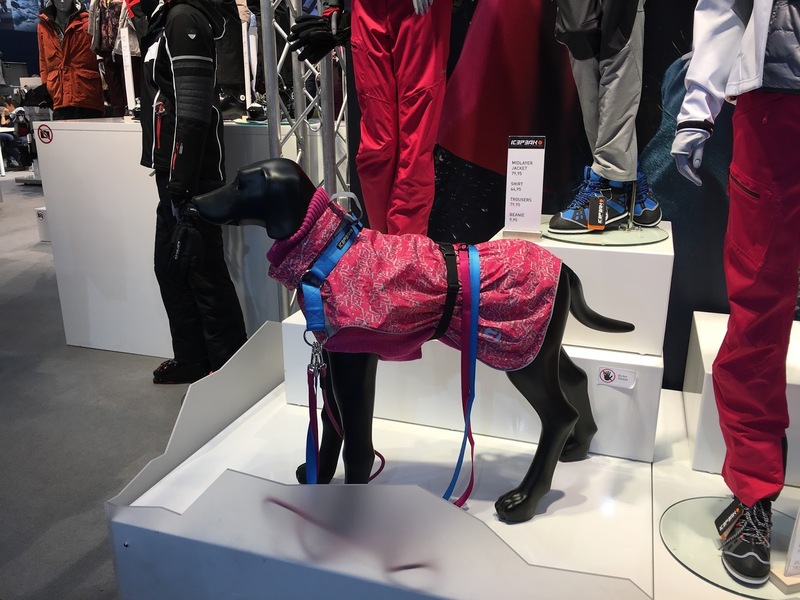 If you wanted a pink padded coat for your dog, you could even get one of those. For the outdoors, stylish pooch, obviously. Even Kilian Journet was there, although – gutting! – I missed him. He is an absolute mountain & ultra running legend. Although, I’m not sure I would have done myself any favours with my star-struck look and stupid questions “So you run a bit...?” And after a few of the free beers on the Salomon stand may even have branched out to ask “So ... headphones Vs no headphones? Walking in long races vs running all the way? Forefront running vs heelstrike ...?” And it would all have gone downhill from there. 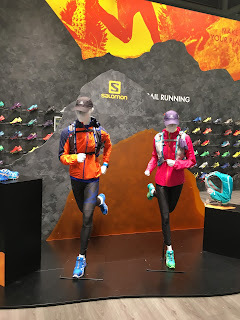 I loved seeing all the kit (I’m a runner – I always want more kit! 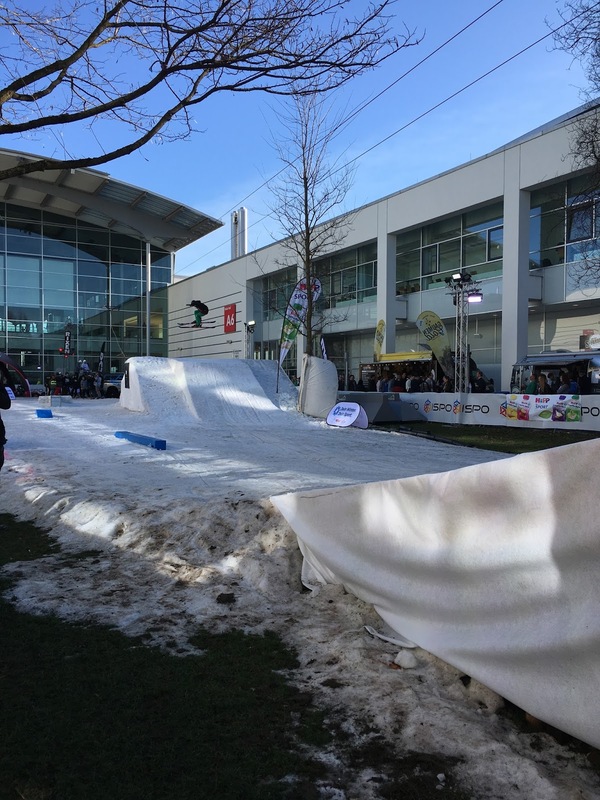 ), all the different shows and getting a different view of outdoor sports that I wouldn’t normally see in the UK. There was so much to ISPO - a fashion show, an exhibition by children doing flips on skis and snowboards on the snow outside (I can’t even stand up on skis! ), a festivals-worth of tents set up, acres of gym equipment, hundreds of gadgets, yoga classes going on ... there was a bit of everything. However, I did feel a bit patronised by the entry turnstiles. After lugging my bags from the taxi, I’d juggled these around and finally managed to scan my card to let me through the turnstile. However, if you’re too slow – as I was - it turns automatically which shoots you out the other side with a patronising pat on the bum from one of its metal arms. I had an amazing day despite being a little bit sulky that my coach refused to accept ‘sprinting with luggage through airport as a training session even though I told him I had tried really hard and would definitely have got a Strava segment if I’d remembered to switch my Garmin on. However, this was more than made up for when Frank and Jean-Francois and I were taken for a run by Philippe of Salomon in the old Munich airfield not far from the exhibition. There was ice on the ground, mountains in the distance and a lovely sunrise, but the paths were very flat. The boys therefore decided that we couldn’t just run around on these so spotting a ski slope in the distance decided we should all run UP it. Then back down again … through the brambles. Who wanted a flat run anyway? Everyone knows adventures make your breakfast taste better. Thanks for the invitation Salomon. I loved it.